To tow is to "pull" or "push" a vehicle with another vehicle from one destination to another. A vehicle pulling another vehicle with a tow strap or tow hitch as a connector. Pulling a vehicle on a dolly. Hooking up and pulling a vehicle with a wrecker tow truck. Carrying a vehicle on a flat bed tow truck. So there are various ways to tow a vehicle. But one major thing to remember is, whatever means that is used to tow a vehicle, that means is just a tool. 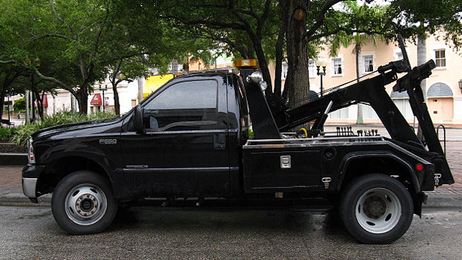 To tow a vehicle, it takes a properly trained tow service professional. The "know how" is what it takes to tow a vehicle, and a tool does not have the know how in itself. A tool by itself is like a body without a brain. We are the brains to the Hawaii towing service. We are properly trained to tow your vehicle safely for the sake of your safety, others, ours, and your vehicle's. To tow a vehicle isn't as easy as just driving. It takes procedure, knowledge of tow capacity, weight, speed, proper hook up, account for weather (wind, rain, and other conditions), knowledge of the type of vehicle being towed, stress points, angles, geometry, road rules, laws, legalities, and so on. So, we typically do not recommend having any "joe" off the street or someone with a tow truck tow your vehicle. Before getting your vehicle towed, be sure the tow truck driver is properly trained, certified, with updated safety checks, documentation, licenses, insurance and paperwork to validate his or her towing ability. Or to make it easy for you, save the stress of screening and call us at (808) 425-9250. Hawaii Tow Company & certified tow truck drivers!